The following is a case of an 18-year-old man who, aside from a psychiatric condition, was a healthy individual in which the incidental finding of EDTA-PTCP had no association. An anxious 18 year-old male with an unremarkable medical history presented to ambulatory care after complaining of vague chest pain and difficulty breathing following his morning exercise session. The patient denied any traumatic events associated with physical training that morning, and his coworkers had not noticed any changes in his performance level. The patient stated that the symptoms began after the activity was completed and described his problem as an inability to "catch his breath." The patient is a naval service member awaiting orders for rigorous duty as a Navy Diver when the incident occurred. He was noted to have begun use of an ephedra-containing supplement approximately 4 days before his presentation to the clinic. Aside from the recent supplement use, the only medicine he utilized was fexofenadine for seasonal allergies. He denied tobacco and alcohol use during the interview. His family history was remarkable for cardiovascular disease on both sides of his family, but none of which were considered premature by age criteria. Additionally, his mother's family had a significant history of anxiety disorders, panic attacks, and attention deficit disorder. Upon arrival to the clinic, the patient's temperature was 98.3 °F, blood pressure was 128/80 mmHg, and his pulse was 102 beats per minute. His respirations also were rapid at 22 breaths per minute. His head and neck exam was unremarkable. His heart rate was tachycardic with a regular rhythm. There were no appreciable gallops, murmurs, or rubs with exam. Breath sounds were equal bilaterally without crackles or wheezes. His abdominal exam was unremarkable, as was his extremity exam. Neurological exam was notable only for obvious bilateral resting hand tremors. An EKG revealed sinus tachycardia with no ST or T wave changes. His pulse oximetry was also normal at 99%. Labs were drawn and included a complete blood count. The Chest x-ray was consistent with hyperaerated lungs with some flattening of the diaphragms. Spirometry followed and was found to be normal. 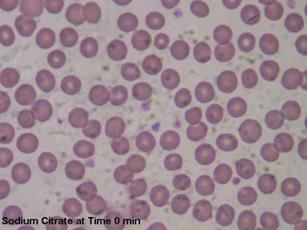 By the time these later studies were completed, his CBC was returned with a critical value of 34 x 103 platelets. The rest of the CBC was normal. Upon reviewing his initial labs, the patient was brought back into the exam room for a closer inspection of his integument for signs of petechiae or echymosis consistent with a platelet disorder. This follow up exam remained normal, and his history remained devoid of clues for easy bruising, gingival bleeding or bloody bowel movements. After reinspection was complete, a microscopic review of the sample was conducted. Numerous megakaryocytes appeared to be present in each high power field, but upon further review, the finding was consistent with groups of thrombocytes tightly clumped together. The patient's blood was redrawn and run immediately. The follow up platelet count was normal at 219 x 103. The same sample was run again 10 minutes later and found to be 108 x 103. Again, microscopic exam revealed significant clumping. Upon determination of incidental pseudothrombocytopenia, a clinical diagnosis of generalized anxiety disorder was made. The diagnosis was supported by a long-standing history of similar symptoms, which extended into his early teenage years. He was released with a prescription of diazepam and a consult to Mental Health for a routine follow-up evaluation. The patient returned the next day reporting a positive response to the medication. A clear notation was made in his medical record regarding his unusual reaction to the EDTA in the lavender top collection tubes. Much like an allergy to medication, pseudothrombocytopenia was recorded in his permanent medical record. 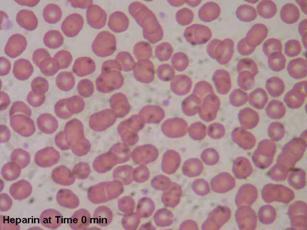 Figures 1 and 2: Microscopic images of blood anticoagulated with EDTA at time of blood draw and 10 minutes later. Increased clumping in figure 2. 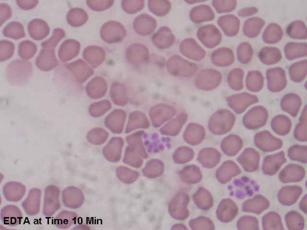 Figures 5 and 6: Microscopic images of blood anticoagulated with sodium citrate at time of blood draw and 10 minutes later. Note the increased clumping in Figure 6 but not as notable as in Figures 2 and 4. Given the widespread use of EDTA-containing vacutainers for blood collection, identification of PTCP requires a high index of suspicion after the identification of thrombocytopenia in the absence of a suggestive medical history. 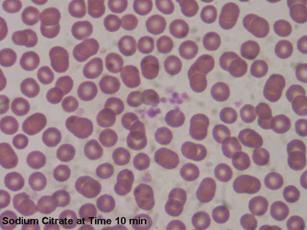 Examination of the peripheral blood smear provides evidence of PTCP in the form of platelet clumping. This, in addition to prompt analysis of freshly-collected samples, will help to decrease, if not eliminate, needless laboratory testing and unwarranted transfusions. (3) Our patient is an example of an otherwise healthy individual who, in light of his current condition, was suspicious for EDTA-PTCP. Nonetheless, an awareness of this particular condition is necessary, because its lack of recognition may lead subjects with a normal platelet count to be considered, and at times treated, as if they were severely thrombocytopenic. (1) A picture only more complicated if other comorbid conditions exist in which to cloud the medical history with potential causes for "true" thrombocytopenia. Van der Meer, W., Allebes, W., Simon, A., van Berkel, Y., & de Keijzer, M. H. (2002). Pseudothrombocytopenia: A Report of a New Method to Count Platelets in a Person With EDTA- and Temperature-Independent Antibodies of the IgM Type. European Journal of Haematology, 69, 243-247. Dalamangas, L. C., & Slaughter, T. F. (1998). Ethylenediaminetetraacetic Acid-Dependent Pseudothrombocytopenia in a Cardiac Patient. Anesth Analg, 86, 1210-1211. Sakurai, S., Shiojima, I., Tanigawa, T., & Nakahara, K. (1997). Aminoglycosides prevent and dissociate the Aggregation of Platelets in Patients With EDTA-dependent Pseudothrombocytopenia. British Journal of Haematology, 99(4-II), 817-823. Allerheiligen, D., Houston, R., & Vermedahl, B. (1996). EDTA-Induced Pseudothrombocytopenia. Jornal of the American Board of Family Practice, 9, 212-214. Sweeney, J. D., Holme, W. L., Heaton, D. C., & Bowen, M. L. (1995). 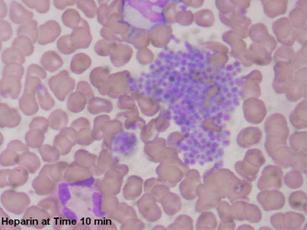 Pseudothrombocytopenia in Plateletpheresis Donors. Transfusion, 35, 46-49. Mori, M., Kudo, H., Yoshitake, S., Ito, K., Shinguu, C., & Noguchi, T. (2000). Transient EDTA-Dependent Pseudothrombocytopenia in a Patient with Sepsis. Intensive Care Medicie, 26, 218-220. Matarazzo, M., Conturso, V., Di Martino, M., Chiurazzi, F., Guida, G., & Morante, R. (2000). EDTA-Dependent Pseudothrombocytopenia in a case of Liver Cirrhosis. PANMINERVA MEDICA, 42, 155-157. Ahn, H. L., et al. (2002). EDTA-Dependent Pseudothrombocytopenia Confirmed by Supplementation of Kanamycin; A Case Report. The Korean Journal of Internal Medicine, 17, 65-68. Bartels, P., Schoorl, M., & Lombarts, A. (1997). Screening for EDTA-Dependent Deviations in Platelet Counts and Abnormalities in Platelet Distribution Histograms in Pseudothrombocytopenia. Scand J Clin Lab Invest, 57, 629-636. Kabutomori, O., & Iwatani, Y. (1995). 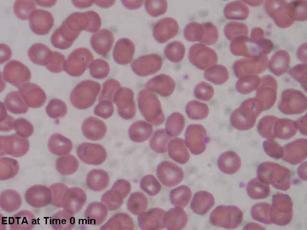 "Correct" Platelet Count in EDTA-Dependent Pseudothrombocytopenia. Eur J Haematol, 55, 67-68.